Hmmm, seems I've been away from the blog for a little bit! You'll have to forgive all my bloggy sins though since it's my birthday today! Yes, yes it is; I'm even closer to thirty than to twenty today than I was last year. You really will have to excuse my absence; for some reason getting back into the swing of things with school has been very difficult this time around. I think I'm starting to get used to it again but I guess my brain just really wants to be done! And if you follow me on Twitter, you know that I've been sick for over a week...yuk! I think I'm at the tail end of it now, but I'm still a bit under the weather. It's just a simple ribbed scarf, but I'm not joking when I tell you that this is the first knitted project I've actually ever finished. Crazy, I know! I learned how to knit when I was about 7 years old, but just never finished anything. I used the same idea and made Alex a ribbed scarf too using some Lion Brand Wool-Ease Thick and Quick in Wood, but cast on fewer stitches to take into account the chunkiness of the wool. I don't have a picture of my Autumn to show you right now; I never realized how difficult it was to take a picture of a hat on your self so I'm going to have to ask Alex to do it! But here's a picture of the lovely Madelinetosh Tosh DK that I'm using for my cowl, it's super-yummy! This colour is called Composition Book Gray and I bought it at The Knit Cafe here in Toronto; the lovely lady who owns the store even wound them into cakes for me at no cost - love that kind of service! This picture was actually taken in the shop while she was winding the first skein. My friend Mo had a birthday last weekend, and I knew her boyfriend was buying her a sewing machine, so I decided to buy her a bunch of notions (machine needles, bobbins, thread, pins, buttons, etc) and some fabric. 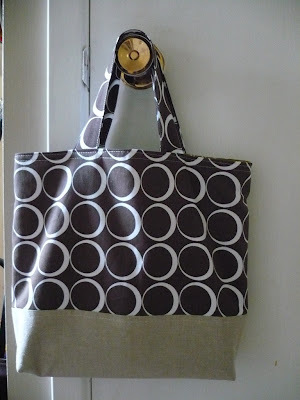 I also made her a tote bag that all the other little gifties went into. The outside was made using a very soft, decorator weight fabric (actually the same fabric that I used on the back of my Mum's pillow) and some linen. For the inside I used a quilting weight cotton and included one of the little labels I printed through Spoonflower recently. Unfortunately I couldn't be there when Mo received it, but she liked it! How about a little sneaky peek of something one of those top-secret projects that will be coming out this month? Yes? Okay! Oh, and did I mention that Alex got mu a Bamboo Pen tablet for my birthday?! So very cool! I had been looking at the Bamboo Craft and Bamboo Fun tablets, but the Bamboo Pen is a very good entry-level tablet and I've already spent the morning watching all the tutorials and playing around with it a bit. Can't wait to get the hang of it and find out what it can really do! 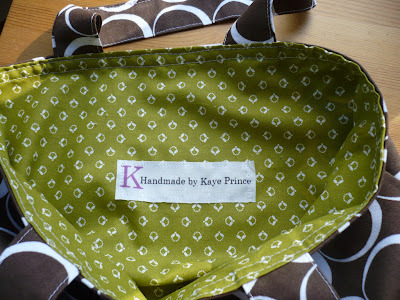 Trust me, I still have a bunch of things to show and tell you but right now I'm going to sew! I've been having a rough time lately with that too (with finding time and feeling creative) but right now I really want to so I better get on it before the feeling flies away! Birthday hugs to all of you! happy birthday!! Hope you're having a great one! Happy Birthday from the west coast! Happy Birthday! And congratulations on finishing your first knitting project! Happy happy birthday my dear!~ I can't wait to see your Autumn and honey cowl too! I just cast on for JR's Pasha and went a little nuts at my LYS this morning and got some Tosh Pashmina for a honey cowl too! I have no idea how I'll finish all this but it's fun to try. I hope all your bday wishes come true! I love the gift for your friend. So thoughtful. Awwww what a locket gift for your sewing friend! I am sure it will be well received! And it sounds like you scored too! Yay for tablet fun! Happy Birthday Kaye!! I hope you had a wonderful day. You share the same birthday as my sister Kate Conklin. Love the scarf and the tote bag and I can't wait to see more of your sneak peek!